A few days later than promised, I'm revealing the topic of my almost-complete game. This game will be a clone of Slender: The Eight Pages, featuring 4-level interrupt-based greyscale, and all the static effects you know and love. The game will be rendered in 3D. Granted I won't be able to emulate the creepy music, but I'm sure the game will be fun, if not scary. 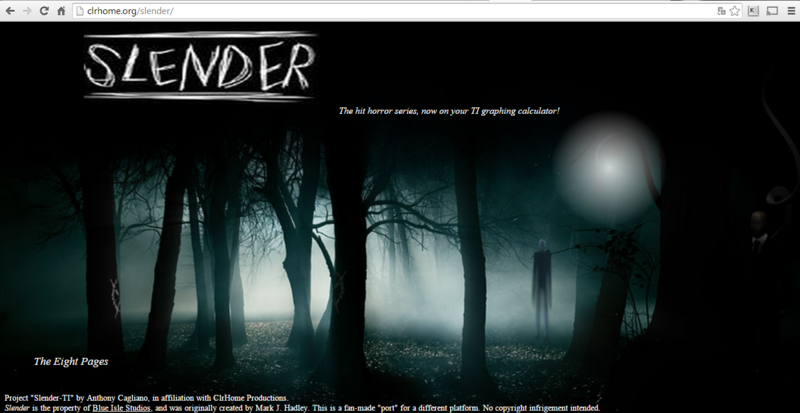 If this game is well-received, I will clone the rest of the Slender series as well. I am curious about how it will look like and the rendering speed. Do you have any screenshots so far? It would be very nice to see this game on calc. 2. Increasing the page collect range (right now it will only pick up if you're right on the page. I'd like it to work if you're like 1 or 2 away). Same with Slender catching you. Right now, death only triggers if he's on top of you. PS: thanks to sorunome and Iambian. Sorunome helped me get the interrupt greyscale figured out, and Iambian helped me understand how to do the static, and slightly modified the greyscale so I could fit it in there. Well, with the exception of a dithered mask for the flashlight, the game's coding is done. Now, just have the map and sprites to do. PS: Individual segments that I could test have been verified to work. Whether the whole game will function as expected on first compile remains to be seen. Slender's sprite is done, now gonna try the page and a tree. Just a warning, I am GOD AWFUL at pixel art, so if anyone can make the sprites look prettier, please do so. Just remember, 4-level grey, and as though viewed at night. To contribute sprites, upload them to https://www.omnimaga.org/art/sprite-fine-tuning-(slender)/msg399423/, or post a link to the image here. With help from Zeda, the scaled sprite routine I downloaded from Badja has been modified to AND the mask and XOR the sprite in one pass, instead of the 3-passes I was looking at before. Now, coding-wise I am left with a by-distance sorter for POV rendering (as of now, it simply renders in the order they occur in the map). After that, have 2 more sprites and the map to make. Here are the sprites that I've made. Now I just have the car and an oil tanker left to go. But please, someone help with that tree (it should be a tree viewed at night). If someone can make it look better, please do. So far, I'm happy with the others. On another note, upon completion, if anyone is willing to fork this project into a version for the color TI's, they are welcome to do so. That also applies to any clones I may make for the rest of the Slender series. Simply PM me and I'll discuss git access to the source code. Here's the code to get flashlight working on your project page. Depending on your Safari version, you may need -webkit-radial-gradient. What specific version is having issues with the CSS? Please consider using a more high resolution logo. Done and updated! Also, anyone with a Twitter, wishing to bump my permission request to Blue Isle Studios, go for it. Im @ACagliano, and you should see it under my outgoing tweets. Also, if anyone is interested in recording themselves (with or without face cam) playing The Eight Pages PC version and sending me the video so I can embed it in the page. Or I could use pewdiepie or markiplier's series. Well, there's no reason why you can't. Any chance we get a screenshot of the game ? Imagine this on a TI-Presenter! The website is looking great now! © Copyright 2000-2019 Cemetech & Christopher Mitchell :: Page Execution Time: 0.281982 seconds.